Actions and neglectful policies of Cuba’s socialist government over nearly four decades will leave a legacy of environmental disruption that future governments will have to reckon with. We have argued elsewhere (Díaz-Briquets and Pérez-López, forthcoming) that the environmental disruptions that have occurred in socialist Cuba were not merely the result of the process of transformation from rural to urban, modern societies. Indeed, we have shown that there were systemic reasons for the disruption, among them government control of the means of production, a tendency toward gigantism, central planning that focused on quantity of output rather than on quality or on how it was produced, a development model that emphasized heavy industrialization and lack of public participation in decision making. Based on our observations in Russia and Ukraine, and on extensive discussions with experts in those countries, we believe that real progress on environmental problems in the countries of the former Soviet Union will lag until there are substantial and far-ranging reforms in basic economic, legal, and social institutions. We do not deny that some targeted technical assistance could produce substantial improvements in environmental quality and quality of life for individuals affected by the assistance. Without basic institutional reforms, however, it is doubtful that these countries will have the capacity to continue the progress made possible by foreign assistance and to generate substantial environmental improvement on their own (Toman and Simpson 1994, p. 74). The first part of the paper summarizes the major environmental problems that will be faced by a post-socialist Cuba. The second part discusses institutional reforms that are essential to attain meaningful progress to improve the environment. The paper closes with a discussion of technical and economic assistance that may be available to a democratic, free market Cuba to conserve and improve the environment. Clean water is one of the most basic needs of any society. Clean water is essential for consumption by the population, for industrial processes, to sustain aquatic life in rivers and streams, and to provide recreation opportunities for the population. Streams, rivers and surface waters in socialist Cuba have been severely polluted by runoff from fields heavily treated with fertilizers, pesticides, and herbicides as well as by untreated effluents from cities, industrial plants—sugar mills, plants producing sugar by-products, food processing plants, etc.—and open pit mining operations. The pollution of surface waters has been so intense that toxic substances have penetrated some of the country’s largest aquifers. Socialist Cuba’s fixation with irrigation resulted in very high rates of extraction of underground water, and there is evidence to conclude that, in at least some parts of the country, an extensive dam construction program may have interfered with the natural recharge of aquifers. As a result, groundwater levels have dropped and, in some instances, sea water has penetrated aquifers, thereby increasing the salinity of underground reserves. During the special period, lack of import capacity caused a reduction in imports of fertilizers and pesticides and in the rate in which these inputs were used in agriculture. This has led some observers to posit that an “organic farming” revolution has occurred in Cuba, one that should be emulated by other countries. To be sure, the economic crisis of the 1990s indeed decreased Cuba’s imports of fertilizers, pesticides, and other chemical products, with a positive impact on the environment. Lack of fuel, likewise, has interfered with the ability to pump water from underground stores. However, how genuine and long lasting will be the shift in agricultural techniques away from chemicals and energy-intensive practices is questionable. Since 1994, Cuba has been borrowing funds abroad to finance the purchase of fertilizers, pesticides, parts for its agricultural machinery, and fuel in order to return to its input-intensive production mode for its sugar and tobacco crops. Cuba’s agricultural model has severely affected soils, bringing about degradation that in many instances will take decades to reverse. The drive to increase land under cultivation resulted in the clearing of lowquality soils prone to severe erosion by wind and rain. In some instances it also led to the loss of forested areas and ground cover, making certain regions more vulnerable to flooding during heavy rains. The excessive use of heavy mechanical equipment resulted in the compaction of many soils. The very intensive use of irrigation without adequate drainage has brought about salinization and waterlogging, rendering some of the affected lands unusable for agricultural production, or severely constraining their productivity. These problems are concentrated in the eastern portion of the country, but are also present in the southern coastal regions of western Cuba (Pinar del Río, La Habana, and Matanzas provinces) as well as in Ciego de Avila province, where salt water intrusions are reported to be severe. Strip mining has also affected soils in the eastern portion of the country. Nickel-containing laterites in the northern coast of Holguín province have been subject to strip mining for many years. Reclamation has been ignored altogether or has lagged far behind. Reforestation is one of the few areas in which Cuba’s socialist government has made a significant positive contribution to the environment. Contrary to the worldwide trends in deforestation, Cuba’s area covered by forests has increased appreciably, from 14% in 1959 to 18.2% in 1989. At the same time that overall forested area was increasing, however, a substantial reduction of old forests was occurring as a result of the expansion of cultivated areas. Major tree losses also occurred as traditional agroforestry practices were largely abandoned when vast-scale state farms and agricultural cooperatives were created during the drive to establish the socialist agricultural development model. During the economic crisis, there has been an alarmingly high rate of instances of cutting down of tree cover and forests for lumber and to make charcoal, since oil-based cooking fuels have been in very short supply. Forests, coastal and inland wetlands, and coral reefs are among the most important ecosystems that provide natural habitats for Cuban species. Loss of old forests has affected watersheds and habitats, as has the introduction of non-native species (García Azuero 1994, p. 1A). Pollution of bays and coastal areas resulting from agricultural runoff and effluents from industrial plants has adversely affected the marine habitat, including coral reefs. There are also some reports that coral reefs are being extracted to use the calcium carbonate they contain in nickel processing operations. During the special period, the Cuban government has focused on the tourism industry as a source of scarce foreign exchange. Substantial investments have been made in the development of tourism facilities, some of them involving construction of hotels and other infrastructure projects that affect very fragile environmental ecosystems, particularly those that until recently were largely untouched by development projects. Examples of this type of infrastructure construction are the pedraplenes constructed in the Sabana- Camagüey archipelago, that include the 24-kilometer causeway between Turiguanó and Cayo Coco, the 43-kilometer causeway linking Jigüey, Cayo Cruz and Cayo Romano, and the 48-kilometer causeway between Caibarién and Cayo Santa María. Airborne emissions from industry and transportation constitute significant environmental problems in socialist Cuba. Carbon dioxide emissions—mostly from electric power plants and industrial facilities fueled by oil and oil products—are a source of concern, particularly in the areas surrounding the source of the emissions. During the special period, Cuba has increasingly turned to domestic or low-quality imported oil to reduce the oil import bill; these grades of oil, rich in sulphur, have aggravated the nation’s air pollution problems, offsetting reductions in other sources of air pollution resulting from the contraction in economic activity. Oil refineries and cement and nickel plants emit huge amounts of dust and particulant matter into the atmosphere, damaging air quality. Because of its geography and prevailing wind patterns, Cuba is fortunate in that the concentration of pollutants over the country dissipates rapidly. However, the toxic plumes contribute to general atmospheric pollution in the area surrounding Cuba, reaching as far as Mexico and the continental United States. Automobile emissions present less of an environmental problem in Cuba compared to other countries because of the relatively low density of automobiles per capita in the island. However, the Cuban stock of automobiles are heavy polluters: they are of quite old vintage, a large portion predating use of catalytic converters, and are in a state of disrepair. In comparison to Poland and other Central European nations where pollution from coal-burning heavy industry and electric power plants poisoned entire regions, environmental damage in Cuba is less severe. Nevertheless, remediation of environmental damage in the form of salinization and soil erosion associated with excessive irrigation, pollution of rivers, bays and coastal waters, and unreclaimed areas that have been strip mined, are significant trouble spots that will be expensive and time consuming to remediate. • Scientist José Oro (Remos 1996, p. 11A) estimates that remediation costs could range between $2 billion and $3 billion if standards similar to those recommended by the United States Environmental Protection Agency were to be achieved. Soil desalinization will cost between $600 and $800 million, removing chemical pollutants between $600 and $700 million, and removing other water residues between $800 and $900 million. These remediation efforts will have to be sustained over a multi-year period. • Cuban scientists estimate that cleanup of the Almendares river in the city of La Habana alone will cost upward of $20 million (“Sanear el Almendares” 1996). • Many more millions of dollars will have to be spent expanding and upgrading the country’s poorly maintained sanitary infrastructure and in protecting the natural environment in coastal regions damaged by poorly designed water development projects and by international tourism centers. The cost of reducing salt concentrations in coastal aquifers infiltrated by sea water is unknown but likely to be considerable. It has been estimated that the cost of cleanup and restoration of the Everglades and Florida Bay in South Florida, an ecosystem comparable to some of those damaged in south central Cuba, will eventually reach $5 billion (“The 50-Year War” 1997, p. 14). Although it is impossible to predict with precision the size of Cuba’s environmental remediation bill, it can be assumed that it will be in the billions of dollars. It is essential during Cuba’s transition to set into motion a domestic process that results in: (1) effective environmental laws and regulations; (2) credible and effective institutions to manage environmental policies; (3) suitable structures of private ownership; (4) devolution of government authority; and (5) adequate public participation in decision-making (Kabala 1992, p. 13). Socialist Cuba lacks adequate general environmental legislation as well as sector-specific laws and regulations to deal with environmental problems associated with individual industries. The general environmental law, Law No. 33 of 1980, is typical of environmental laws of socialist countries in the 1970s. These laws were premised on the intrinsic harmony between socialist economic development and protection of the environment. Their emphasis is on the “rational use” of natural resources, with environmental disruption defined as the deviation from rational use. The severe environmental damage that occurred in the socialist countries—despite the existence of this type of environmental laws—is clear evidence of their lack of effectiveness in protecting the environment. • Poland passed legislation enacting a comprehensive national environmental policy that, among others, set specific targets for air emissions and established a system of incentives for pollution control equipment. Poland also approved strict automobile emission standards that required catalytic converters and unleaded gasoline. • Hungary passed laws requiring firms building or expanding plants to submit environmental impact assessments before receiving construction permits; requiring all vehicles to undergo annual emission inspections; and offered tax incentives to vehicles with catalytic converters. The government also devised a new tax or fee system to stem the further degradation of air and water resources and a freedom of information act that would allow public access to government data and allow the government to publish material on polluting enterprises. • Czechoslovakia drafted a general environmental law that anticipated command-and-control laws and environmental taxes; gave citizens the right to obtain information about the environment and required companies to provide it; allowed citizens to claim rights under the environmental laws in court; and required environmental impact assessments before the initiation of any construction activity, use of natural resources, or production of products. An essential first step during the transition is for Cuba to enact a new set of environmental laws (including regulations, standards and norms) that are realistic and provide an effective framework for environmental protection.2 Laws and standards need to be realistic or risk contributing to cynicism and perpetuating inefficient practices.3 General laws should separate out promotional and regulatory activities. Among the principles that might be included in such laws are requiring environmental impact assessments before granting permits for construction activity beyond some threshold value or in environmentally sensitive locations, requiring that automobiles be equipped with pollution abatement devices, and making information about the environment available to the public. To avoid the rush to design all-encompassing laws with little flexibility, it might be preferable to implement realistic interim regulations and to delay passage of major legislation until there has been an effective national dialogue on these issues (Ackermann 1991, p. 10). Environmental agencies in socialist Cuba are weak. Regulatory authorities lack autonomy from the central government and enforcement capacity. Not only are environmental laws and regulations nonspecific— which makes them difficult to enforce— but enforcement lines of authority are unclear and there is uncertainty about who is to be held responsible for environmental damage. Moreover, bureaucratic units are responsible for ensuring their own compliance with environmental laws, with conflicts of interest often arising since those responsible for attaining production goals are also responsible for overseeing and enforcing environmental regulations. In several documented cases, economic needs have overridden environmental concerns. Bureaucratic reshuffling in 1994 that moved the main environmental protection agency, Comisión Nacional para la Protección del Medio Ambiente y Conservación de los Recursos Naturales (COMARNA), to the Ministry of Science, Technology and Environment does not seem to have significantly affected that agency’s autonomy or enforcement capacity. For over three decades, Cuba’s socialist government has actively worked to eliminate the market-oriented institutions that existed in Republican Cuba and to supplant them with institutions that support a centrally- directed economy. During the transition, Cuban policy makers must begin to rebuild an institutional framework for the market that will promote competition, promote efficient economic management and control, create and regulate factor markets, devise and implement a tax system, and protect the environment. Institution-building is an expensive and time-consuming undertaking, however, as it takes considerable investment of money and time to develop the human resources necessary to make these institutions carry out their mandates effectively (Pérez-López 1994, pp. 296-298). Clearly, environmental laws and regulations that are not backed by a strong institutional structure and sufficient enforcement resources have little value. Monitoring and inspection systems must be credible—to the government as well as to the private sector and the general public. To be credible, they have to be independent of entities that own the resources being monitored or whose role it is to promote production. It is common in many countries— not only in socialist countries—for the public sector to own the most polluting industries. Environmental disruption in the former Soviet Union and the old communist countries of Eastern Europe clearly demonstrates that the public sector is notoriously bad at policing itself: “Being both poacher and gamekeeper does not work, especially when public agencies are responsible for such essential but massive tasks as wastewater treatment or solid waste disposal” (World Bank 1992, p. 84). Institution-building in the environmental protection area is a slow, costly and difficult process. It requires well-trained technical personnel and professional managers with job security—to prevent them from being dismissed when their actions do not please powerful interests—as well as adequate financing. Cuba must meet the challenge of beginning to build these institutions during the transition in order to be able to set the bases for meaningful improvement of the environmental situation in the mid and longer term. In socialist Cuba, nearly all of the country’s productive resources are owned and operated by the state. The only exception is the agricultural sector, where 5-8 % of farm land is under the control of individuals. As with state enterprises throughout the socialist world, Cuban state enterprises lack defined property rights that spur work effort and profit making in market economies. They have little incentive to use inputs efficiently and to limit pollution. They operate under a “soft budget constraint” which allows cost increases to be passed on, and under which industries could rely on government to bail them out rather than lose the enterprises’ production or create unemployment (WRI 1992, p. 5). Environmental fines are weakly enforced and ultimately the state pays the fines levied, as they are part of the budgets of enterprises. A precondition for authentic environmental protection under a market framework is a pattern of ownership of resources that allows economic actors to internalize the economic benefits of gains in efficiency in production processes. This means, among other considerations, strict budgetary constraints on producers and the elimination of subsidies that distort the price signals received by producers (Kabala 1992, p. 13). During the transition, Cuba must proceed rapidly to curb the state’s role in the economy by (1) turning over to the private sector productive resources it currently controls, i.e., privatize; and (2) creating the basis for the establishment of new private enterprises. While privatization runs it course and private enterprises grow in number and significance, prices of energy and natural resources (including water) must rise to stem overconsumption and begin the process of internalizing pollution control costs. Similarly, subsidies to enterprises must be curbed or eliminated, particularly those to the most blatant polluters, which may have to be closed even if this means loss of jobs. Cuba’s economic decisionmaking process is extremely rigid, with most decisions regarding nature of investments, location, technology, etc., made from the top, in accordance with a national plan developed by the central government. Provincial and local government authorities are weak and underfunded and play a very marginal role in economic decisions that affect the environment. In the 1970s, Cuba adopted a system of government called People’s Power (Poder Popular) which created government institutions at three levels: municipal, provincial, and national. Enterprises were made subordinate to the level that was served by their output or at which they were deemed to have the most importance. For example, enterprises whose output was deemed to be of national importance, such as sugar mills, nickel mining complexes, tourism facilities, were considered as national enterprises, subordinate to the appropriate sectoral ministry of the central government. Enterprises whose output served a region were considered to be the jurisdiction of Provincial Organs of People’s Power. Since very little production is made only for the municipality in which it is made, enterprises under the jurisdiction of Municipal Organs of People’s Power are mostly those engaged in retail trade (pharmacies, candy shops, cafeterias, movie theaters, etc) or in providing services to the population (health, education, sports, culture, and communal services such as parks and sanitation) (Malinowitz 1997). Local self-government is ruled out in Cuba. The 1992 Constitution is clear about the endorsement of centralism when it states that Cuba has a socialist economy (Article 14) with a comprehensive central plan. It also states that “decisions taken by higher state organs are mandatory on lower ones” (Article 68(d)) and “lower state organs are responsible to higher ones and have to report to them about their management” (Article 68(e)). An Executive Council composed of the President of the State Council (Fidel Castro himself) and Ministers appointed by him, may decide matters which are the competence of the Ministers’ Cabinet (Article 97). The Cabinet may revoke decisions of subordinated administrative organs accountable to the Municipal Assembly. During the transition, as central planning is eliminated and a private sector begins to emerge as a result of newly-created enterprises and privatization, provincial and local authorities should be given a more prominent role in determining the location of investments and plans to control environmental disruption. It is not an overstatement to say that Cuba has been more effective in preventing public participation in decision making than any other socialist society, with the possible exception of North Korea. The controls on the formation and operation of independent organizations has extended to environmental groups. As a result, the public has not been availed of mechanisms to express its views on policy decisions that affect the environment and public education and general public understanding and appreciation of environmental issues has lagged. Independent environmental movements emerged in Eastern Europe in the 1970s. Government restrictions on public discussion and speech severely affected their ability to express environmental concerns and educate the public on environmental matters. These groups relied primarily on underground journals to transmit whatever information they could obtain on environmental conditions in their country. In 1980, however, the Polish Ecological Club—the first fully independent environmental group in the region—was created in Krakow. A coalition of trade unions, scientists, members of the Polish Ecological Club, and the press were successful in convincing the Polish State Ministry of Metallurgy to close down the Skawine aluminum works, a heavy emitter of toxic fluoride emissions, located near Krakow (WRI 1992, p. 60). Environmental movements played an important role in toppling communist governments in Eastern Europe in 1989-90 (WRI 1992, p. 60). Our concept of civil society is not the same as they refer to in the United States. Rather, it is our own Cuban socialist civil society, encompassing our strong mass organizations, namely the CTC (Central Organization of Cuban Trade Unions), the CDRs (Committees for the Defense of the Revolution), the FMC (Federation of Cuban Women), the ANAP (National Association of Small Farmers), the FEU (Federation of University Students) and FEEM (Federation of Students in Intermediate Education) and the Pioneers. There are also social groups which, as is known, include veterans, economists, lawyers, journalists, artists and writers, as well as other NGOs which operate within the law and do not attempt to undermine the economic, political and social system freely chosen by our people. Even though they have their own characteristics and terminology, in conjunction with the revolutionary state, they pursue the common objective of building socialism. In the environmental area, the leading Cuban-style NGO is Pro-Naturaleza, an organization created in April 1993 reportedly having more than 5,000 members nationwide. According to Gunn (1995, p. 2), Pro-Naturaleza is sponsored by the Ministry of Science, Technology and Environment; most of the leadership of the organization is employed at the Ministry; and it is housed rent-free within the Ministry. Although Pro-Naturaleza has not received any state funds, the membership funds it collects are insufficient to pay for a secretary and a researcher, and it has asked the Ministry to cover the salaries, with the request that this donation not be used to “encroach on the organization’s independence.” Gunn gives examples of Pro-Naturaleza’s independence and acquiescence to the state: in 1993, the organization’s “citizen complaint” facility followed up a report by a resident of Santa Cruz del Norte regarding the cutting down of trees for firewood by workers of a sugar mill and obtained action by the local authorities to provide the workers with kerosene so that they would not have to cut trees for cooking fuel; a citizen complaint about effluents from a state slaughterhouse that were polluting a river did not lead to any positive response, as Pro-Naturaleza readily accepted the enterprise’s argument that no funds were available to purchase equipment to address the problem (Gunn 1995, p. 7). In a market economy, the private sector—and private investment—can carry out many of the functions that are the responsibility of the state in socialist societies and that require the expenditure of public resources, e.g., build and operate energy-efficient power plants, extract and refine minerals, reclaiming land and minimizing water and air pollution. Nevertheless, a market-oriented post-socialist Cuban government will face many competing demands on the resources it will have available to deal with public policy challenges. In addition to environmental problems, future Cuban governments will face challenges such as a large external debt, outdated plant and equipment, and crumbling infrastructure. Cuban state enterprises, as their counterparts in other socialist countries, are notorious for their disregard for the environment. Some of the worst offenders among these enterprises may have to be shut down at once, thereby creating losses in employment and production. Small businesses and foreign investment will hopefully create new sources of employment to absorb those workers who are dislocated from state enterprises. It will be essential to require environmental impact assessments for all new investments and a mechanism to take them into account in decision making to avoid adding to the already-existing environmental problems. Mitigation of the most serious environmental problems that post-socialist Cuba will face will require a great deal of resources. The bulk of those resources will have to be generated internally. However, some external assistance is available to deal with some of the challenges and to improve environmental management. Given budget constraints of most governments, there are very few resources available for foreign aid for conservation projects that have more than local significance. Thus, national efforts tend to be financed by local resources while multilateral support is concentrated on cross-border global issues. An example of the latter is the Global Environmental Facility (GEF), a fund created in 1991 and administered by the World Bank, whose purpose is to provide grants to deal with four major cross-border environmental problems: 1) loss of biodiversity; 2) global warming; 3) pollution of international waters; and 4) emission of chlorofluorocarbons (CFCs) (World Bank 1992b, p. 45). In 1996, there were 11 GEF grants under implementation in Latin America and the Caribbean, 6 supporting biodiversity conservation, 3 targeted at climate change, and 2 at international water initiatives (“Latin America” 1996, p. 23). Bilateral foreign assistance may also be available to post-socialist Cuba to deal with environmental problems. An obvious source of foreign assistance for environmental protection and reclamation during the transition will be the U.S. Agency for International Development (USAID). USAID environmental resources are limited, however, and are being mostly assigned to the “management of natural resources used by the marginal poor, and the management of watersheds which provide clean and dependable water sources for urban populations,” under the agency’s strategic objective of offering “improved protection of selected LAC [Latin America and Caribbean] parks and protected areas representing a variety of ecosystems” (USAID 1995, p. 20). In light of these priorities, USAID environmental assistance could be expected to be primarily available for the protection of natural habitats, including perhaps the reclamation of formerly forested areas damaged by open pit mining operations, and less so for the reclamation of agricultural soils damaged by inappropriate agricultural practices or to restore the quality of water bodies adversely affected by mismanagement. Many other donor countries, however, have environmentally-oriented bilateral assistance programs, but there is intense competition for this aid, since the demand vastly exceeds the supply. A sobering consideration is that the document issued by the President of the United States in early 1997 outlining foreign assistance that might be available to support a democratic transition in Cuba does not single out the environment as a priority. However, envisioned processes that build “essential democratic institutions, both in the government and in civil society,” and establish “policy, institutional, and legal reforms necessary to stimulate the domestic private sector, meet the long-term social needs of the population, attract foreign investment, meet conditions for lending from international financial institutions and otherwise lay the basis for economic recovery” (Support for a Democratic 1997, p. 4) are supportive of environmental objectives. An expert on Cuba-U.S. relations has proposed that the United States should assist socialist Cuba financially and technically in the completion of the Juraguá nuclear power plant, thereby allowing the island to ease its electricity shortages during the special period and at the same time addressing United States’ concerns about the safety of the plant (Smith 1995). In a meeting with U.S. energy and environmental experts5 in February 1996, President Castro stated that the future of the Juraguá nuclear power plant was a “very complex question.” He indicated that he looked forward to the day nuclear reactors would become “20th-century pyramids, like those in Egypt.” Moreover, Castro indicated he was open to better ideas on how to proceed regarding the Juraguá plant, a reference to potential assistance from Western nations to abandon its construction (Rohter 1996, p. A6). Uncertainty about the quality of construction of the Juraguá plant makes it highly unlikely that the facility will ever by completed. In a post-socialist Cuba, however, there is the possibility that the United States, other countries, and international organizations might be willing to assist Cuba in building either a safe Western-designed nuclear power plant or efficient thermoelectric plants in return for razing the Juraguá reactors, removing once and for all the possibility of a nuclear accident at this site. There is precedent for the United States and other countries stepping in to assist financially-strapped countries in return for eliminating nuclear plants that are deemed to be dangerous because of the likelihood of nuclear accidents or their potential to produce fissionable materials for nuclear weapons. After reunification, Germany shut down unsafe nuclear power plants in East Germany, and Western Europe and the United States have been assisting Central European countries in phasing out the more dangerous nuclear power plants in the region. In March 1993, North Korea announced that it intended to withdraw from the nuclear Non-Proliferation Treaty (NPT) to protest pressure from the international community to allow inspection of certain nuclear facilities suspected of being used to produce nuclear weapons (Smith 1993). Subsequently, North Korea agreed to “suspend” its withdrawal from the NPT and entered into negotiations with the United States. These discussions ultimately resulted in an agreement, known as the “Agreed Framework,” whereby North Korea agreed to “freeze” its nuclear power program in return for foreign assistance to replace its graphite reactors (which lend themselves to the production of weapons-grade materials) with light-water reactors and interim energy supplies. The Korean Peninsula Energy Development Organization (KEDO), an international consortium of member countries led by the United States, Japan, and South Korea, was created to finance and supply two light-water reactors to North Korea at a cost of about $4 billion, with North Korea expected to repay the loan interest-free over an extended period of time (Smith 1994; U.S. General Accounting Office, 1996). In its post-socialist transition, Cuba must inevitably deal with the environmental legacy of nearly four decades of socialist development policies. The effects of these policies, while apparently not as adverse as in the former Eastern European communist countries and the Soviet Union, warrant serious concern, particularly in the agriculture and mining sectors. At present, there is also growing concern about the environmental consequences resulting from the rapidly growing tourism industry. The Cuban nation will face a herculean task as it begins to reshape it most basic political and economic institutions to adapt to a market economy. The task is no less demanding regarding the environment since balancing the economic needs of the population and protecting nature will require the development of an appropriate legal framework consistent with private property rights, the decentralization of political power, and growing public participation in the country’s governance. To some extent Cuba will have the advantage of learning from others, as it will be able to draw on the accumulated experience of many other countries that have experimented with diverse approaches to achieve sustainable development, both in the developed and the developing worlds. Many lessons have been learned. Environmental problems can not be resolved overnight, but much can be accomplished by the careful setting of priorities and assignation of financial resources. A post-socialist Cuba will also have access to the technical and financial resources of the international community for environmental remediation purposes. With the right regulatory framework, including proper economic incentives, the country will be able to enlist as well the private sector in managing the natural environment to the benefit of current and future generations. 1. This paper presents strictly the views of the authors. 2. According to the Cuban press, the National Assembly of People’s Power approved a new general environmental law in July 1997. The text of the law was not available at the time of this writing. 3. Poland, for instance, may have set air quality standards that are too strict and cannot be met by most cities of the world. See Ackermann (1991, p. 10). 4. 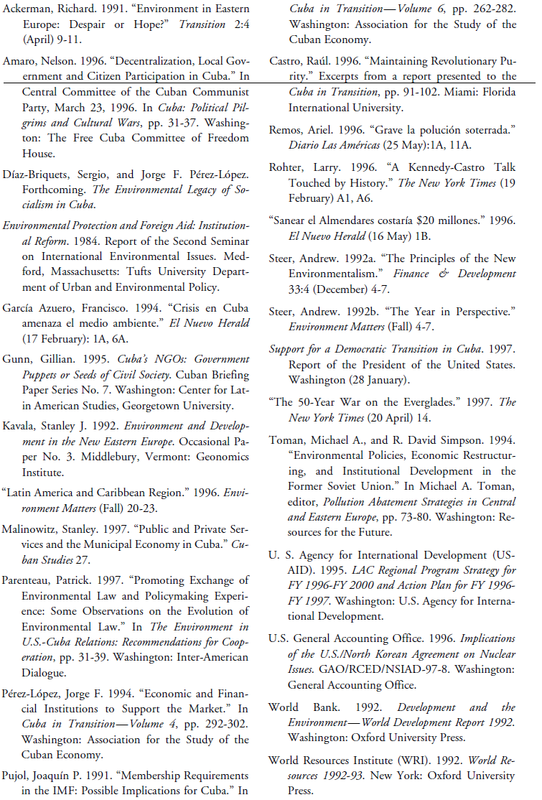 Requirements for Cuba’s membership in the International Monetary Fund, a prerequisite for joining the World Bank and a step that would ease entry into the Inter-American Development Bank, are given in Pujol (1991). 5. The U.S. delegation was led by Michael L. Kennedy, chairman of Citizens Energy Corporation, a Boston-based nonprofit company that promotes the development of alternative energy sources, and by Robert F. Kennedy, Senior Staff Attorney for the Natural Resources Defense Council, and environmental NGO. The two Kennedys are nephews of President John F. Kennedy.